I have taken up CrossFit and I go on Mondays, Wednesdays and Fridays. I go in the evening because of scheduling, and when I get home the last thing I want is a heavy meal. Most CF nights, I just have a protein smoothie (which to me is the perfect thing after a workout), but tonight I already had some wild-caught, Texas Gulf shrimp thawed, so I decided to grill ’em up. While they were grilling, I basted them with a super, quick herb butter. This meal took me literally about 15 minutes from grill to table. 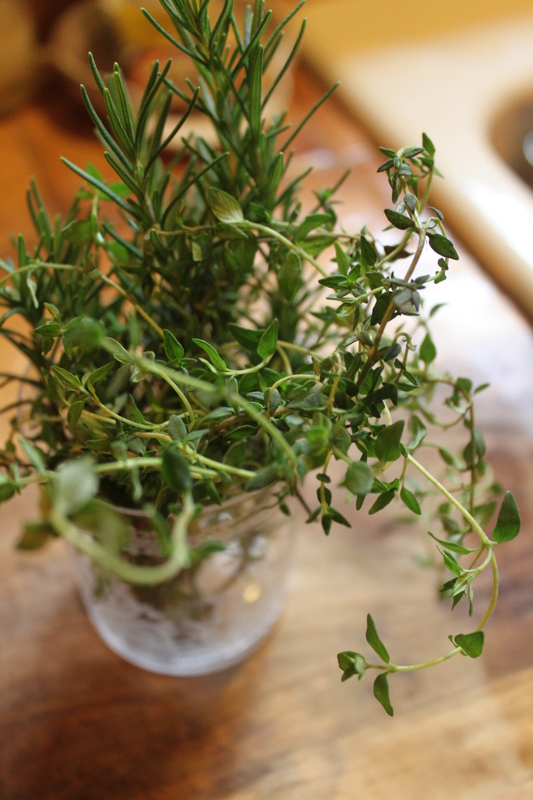 Gather a handful of herbs from the garden. I used thyme and rosemary, but use whatever you have. Chop the herbs and add them to 4 T melted ghee (or pastured butter). Add salt & pepper to taste. Skewer your peeled and deveined shrimp ( I left the tails on) alternating with bell pepper slices (or any other veg you want or have). I only ran into one tiny problem with this recipe tonight. I was out of skewers. So, I had to improvise. Don’t laugh. OK. Never mind. Laugh. Laugh away! It’s a bad pic, but you get the idea. Yep, that’s a coat hanger. Luckily, I had cleaned out my closet today (getting rid of a LOT of clothes that are too big!! woo-hoo) and I had some wire coat hangers that I was sending back to the cleaners. Luckily. Otherwise, I might not have had grilled shrimp and you certainly wouldn’t be laughing. I used to be a girl scout, y’all. I am not making this up. I swear. 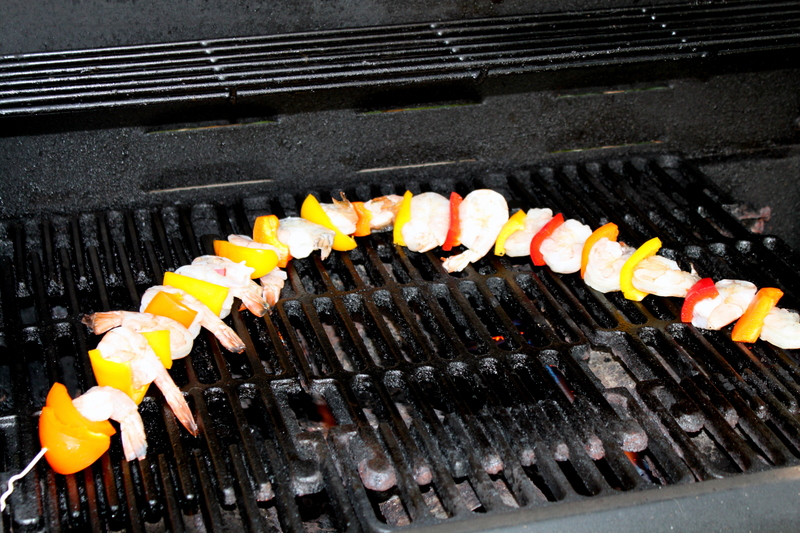 Once skewered on whatever you can find to skewer them on, grill them for about 3-4 min per side, basting a few times. Remove to a plate, drizzle some of the remaining herb butter and gobble. Really. That’s all. That’s dinner. made. simple. Y’all. 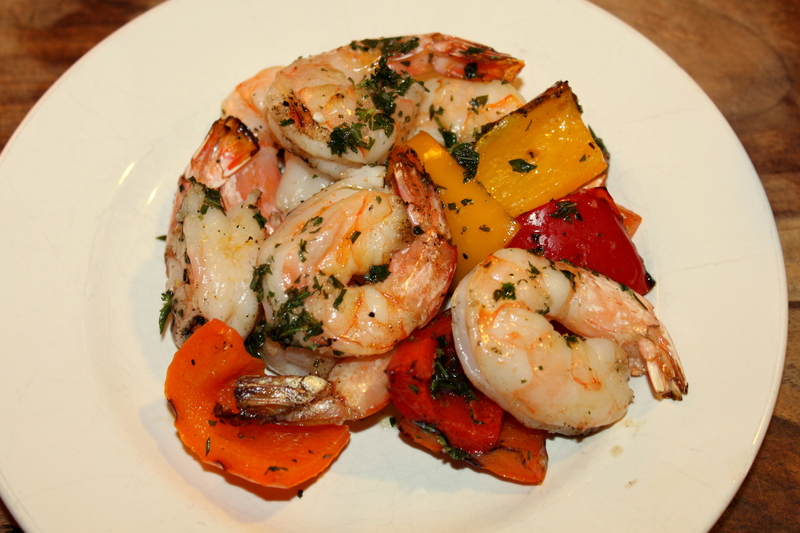 This entry was posted in Uncategorized and tagged dinner, gulf shrimp. ← Think you don’t have time for breakfast? Think again!